The Hudson Town Meeting passed Article 10, to fund a small acquisition of the trail right-of-way at Whispering Pines Condominiums on Main Street. The cost of the acquisition was $20,600. 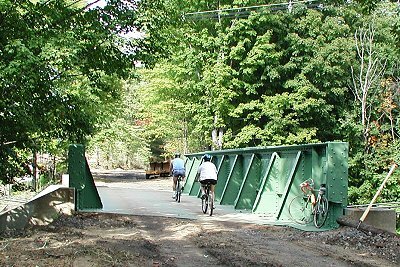 The Acton Board of Selectman, at their October meeting, has indicated its support for the construction of the Assabet River Rail Trail. Town Planner Roland Bartl said that he will be bringing forward an article to the annual Town Meeting next April for funding Acton's 1.1 mile portion of the trail. The total estimated cost of Acton's portion of the $12 to $13 million dollar trail is $1.3 million. Bartl estimates the local appropriation for the trail will be between $200,000 and $230,000, with federal funding and grants. The proposed bike trail was cause for debate at the Selectman's meeting. One concern was the extra people this trail would bring to town creating potential parking problems in residential areas. A resident in support of the trail, thought it would encourage commuter use and mitigate some of the auto traffic. 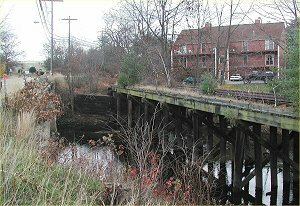 Another mentioned that proximity to the Minuteman Rail Trail was mentioned as an asset in Real Estate ads in Arlington and Lexington. Bartl indicated the budget includes amenities to work with the neighbors. 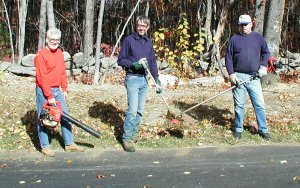 In October, ARRT volunteers did their first ever post-construction trail cleanup on the completed section of the trail in Marlborough. Using equipment supplied by the city, volunteers Peter Jonietz, Mike Duclos, Duncan Power, and Ed and Karen Wild (not in picture) spent several hours raking leaves, removing trash and trimimg weeds. At the request of those attending the October ARRT meeting, Duncan Power sent a letter to the Mass Secretary of Environmental Affairs commenting on Fitchburg St. International Corporate Park environmental impact report. He asked that a minor change be made to produce a uniform and less steep grade on the section of trail descending toward the proposed Rt. 85 Connector underpass. Monthly ARRT meetings are open to the public. Anyone interested in our activities are invited to attend. Meetings are usually finished by 9:00 PM. A biking party including ARRT volunteers recently rode the paved portion of the Nashua River Rail Trail which now connects Ayer to Pepperell MA. The construction and paving of the trail are presently continuing past Pepperell and will end in Nashua NH. Construction completion is expected by the summer of 2002. So far, approximately 8.5 miles of trail are paved with the trail rough in spots from new construction. Halfway along, the trail is detoured for less than a mile through Groton to avoid tunnel construction on the trail. This ride is serene and pastoral with most of the areas around the trail in their natural state. A suggestion was made at last month's ARRT meeting to do a bike ride there as a fundraiser.